Upcyclist, ISBN: 9783791349503 - available from Nationwide Book Distributors Ltd NZ. Upcycling goes upscale in this beautiful, elegant, and global collection that showcases what today’s designers are creating out of yesterday’s materials. Upcycling is the process of transforming seemingly low value items into something new. Today’s upcyclists are creating stunning furniture, lighting, and art objects that combine values of superb craftsmanship and design with ideas of how “waste” can be both inspiring and informing. 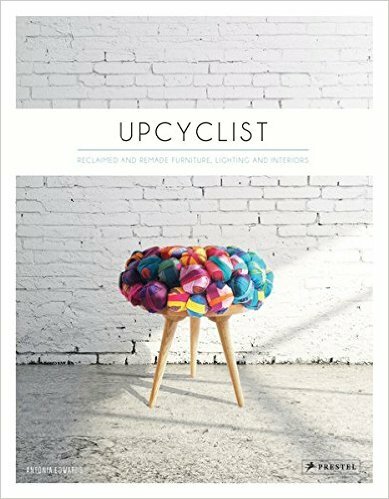 While the environmental and financial benefits of upcycling are readily acknowledged in Upcyclist: Reclaimed and Remade Furniture, Lighting and Interiors, the designers and makers profiled show how the practice can result in pieces that are as aesthetically exciting as anything created using only raw materials. Based on the author’s popular website, this book features hundreds of creations from an international collection of today’s most exciting designers. It is organized by material, with chapters dedicated to wood, metal, glass and ceramics, textiles, plastic, paper, and mixed media. Reclaimed tree branches and barn doors are transformed into exquisite pieces of furniture; bicycle chains into chandeliers; t-shirts into rugs; saris into upholstery. Filled with an enormous range of materials and objects, this unique book will inspire any designer or design-conscious consumer to incorporate upcycling into their creative practice or interior design projects.